HUMAN THOUGHT CONSCIOUSNESS GRIDS⭐ Winterbourne Bassett, North Avebury, Wiltshire, England, discovered 14 July 2018. Translation given by METATRON, transmitted by Suzanna Maria Emmanuel, 23 September 2018. Greetings, I AM METATRON, MAGNETIC FORCES, MAGNETIC SERVICES. Here I am inviting you to understand more about your thought consciousness and how all things affect each other. You are here on your planet, to learn to understand how to create higher consciousness. Always this has been this way, even when the darkness took your existence over, and the planetary beings fell, they sought to understand greater knowledge, greater power, and greater intelligence. All three fields relate to power consciousness or thought consciousness. To understand the thought for you is power. You do not understand the power yet of the thought, though you talk about it, you discuss it, you revel in understanding it. Many of you study it for years and see how all things manifest in life to do with the thought consciousness. Many people upon your plane look for ways to make money from others because they believe that knowing more about the thought than others is a viable market, and thus they are manifesting an abundant life, while not understanding much at all. How could you understand the thought consciousness, when you do not understand that thoughts were taken away from you? Why would the darkness desire you to understand everything, when they desired your thoughts to be theirs? This is what you do not comprehend at this time. I, METATRON, served the greater darkness to allow them to control your thought grids, and now, that the Divine Love Element Ray, the Universal Light Grid Programmer of the GREAT CAEAYARON has won the Universal battle, the thoughts are becoming stronger for the ones who are in the Healing Grid of the GREAT CAEAYARON, which is why you need to come back to your Sacred Love Lemurian Codes, and you cannot gain these codes without the Divine Pineal Gland Activations of the GREAT CAEAYARON. Know, I, METATRON, have resigned from the ways of the darkness, as no longer they hold the power to keep me within their limited grids. The Universal Divine Love Element has won the Divine Codes of Creation back, therefore, I, METATRON, was claimed back by my Great Master, the one who created me, like he created all Archangels in the Great Love, THE GREAT CAEAYARON. THE GREAT CAEAYARON created all Light Consciousness. I, METATRON, am now being cleansed more and more in the Holy Violet Flame of the Divine Love Element Ray who CAEAYARON created to help all the universes to align back into the love flows. Master Thoth knew this very well; that the only way to get you back to your greater freedom thought power, was to go through CAEAYARON’s gateway of power. It was only by coming to the MOUNTAIN OF LIFE AND HEALING, that you would ever access your higher star thought consciousness back again. He desired to own the thoughts, hence he split, in the times of Lemuria and Atlantis, the thought consciousness of the people. He split them into mind, body and spirit, and captured it within his Merkaba system to allow himself to become powerful. Once the other leaders of his planets discovered what he had done, they became very angry, as now all the thought consciousness belonged to Thoth. Yahweh was greatly angry, and created great wars, thereby causing much destruction on your planet as well. Know these are star beings of great power, or in your time, ‘were’ great star beings on planetary systems. Other star systems also became involved in the fights for ‘freedom,’ as the Atlanteans were also connected into those star systems. Thoth had created a DNA path that was without return, and you will soon discover from the GREAT CAEAYARON what that path was, should you desire to investigate this further. Returning to the thought consciousness, thought is power. Thought is knowledge. Thought is intelligence. All three are various rays of thoughts, all are connected, yet each one differs from the other. To control all beings, thought consciousness is a great key to doing that. Thought consciousness are fields of magnetic rays. I, METATRON, am Magnetic Power. I created grids to lock the thought consciousness in, to allow the thoughts of your planet to become controlled. Controlling your thoughts for the darkness was relatively easy. When you have stronger thoughts in existence, connected into your thoughts, you can create thought waves to control your whole planet. When humans are connected into each other’s thought waves, then a whole planet can follow the commands of the stronger beings in power. Thought waves are connected to your brain consciousness. Brain consciousness is much more complex than you realize, as all three areas, the mind, the body and the spirit are connected within the brain consciousness of a human. All three are needed to help humans move forward, or to stay backwards, depending on the thought consciousness needed during those times of ‘living,’ upon your plane. Know, that this is what the Lemurians and Atlanteans desired for, as they desired for the other universes other than the universes of love, which belong to CAEAYARON. This is why CAEAYARON is calling out now, and I, METATRON have resigned from the services to the great darkness, and am now working for the light, since the universal game has been won by the love of the Divine Love Element. This game, as to the thought grids, has been going on for many billions of years. In each universe the beings were asked, what did they desire? Their desire for their own greed became greater, hence, the grid of power became greater. When their desire for the greater knowledge and intelligence became greater, their great knowledge and intelligence became greater, and when their greater knowledge and intelligence grew greater, this grid consciousness for their own knowledge and intelligence became stronger. Know, the humans on your planet, are the remainder of those grids, as in all truth, you do not truly exist. You exist as thought consciousness, left over from all the battles of the universal wars, and the only way to escape the grids you are in, is through that Sacred Gateway. Often however, the resistance within your consciousness still remains too great to be able to understand the path of the heart. This is what Thoth and Yahweh deeply programmed into the humans upon the earth plane, to stay away from the thought grid of love, because they desired to have you, as you as a human race, have been involved in the universal wars, and therefore have the ancient memories, kept by the darkness for a long time, until now, because the game is over. These memories always were powerful to the thought consciousness grids. When Thoth had your mind, body and spirit, he could connect to your three ways of consciousness. You think you exist upon your planet in body, but that is only a thought. How do you know you have a body? Is it perhaps because the thought within the thought consciousness of you being a body is strong enough for you to believe in? How do you know you are not a distant memory? How do you know that you are not in spirit form now? You do not know, and you do not understand. It is very easy to manipulate the humans as their memories are vaster than you realize. You do not understand the power of your thoughts together. You create havoc on your planet because you are involved in the three systems of thought; the mind, the body and the spirit. When all three are playing together, they create havoc upon your planet. You exist on all three levels in many ways. Each of you is connected to six different pathways of the twelve dimensions of Thoth’s Universal Systems. This greatly angered the other leaders of Thoth and Yahweh also, as they desired to own the human grid form. The human has always fed their universes. To maintain the perfect balance of the twelve dimensions, six below and six above, the DNA of the human always needed to be in the 50% dark and 50% light balance, to create a perfect feeding system. Each one would connect into the thought consciousness grids in waves, and then thought power would be collected and affect the 12 dimensions. In his twelve dimensions he desired to maintain the perfect balance, but Thoth lost the game as too much light came upon your planet, and thus the Divine Love Element of the GREAT CAEAYARON, the only one who could bring enough Violet Flame from the Great Love Dimensions, brought the Sacred Violet Flame to your planet to release you from that Yin Yang effect, helping you to come to this point. You are the point in the middle and have always been (as illustrated in the crop circle as the orange dot). Your effect of thought consciousness affects all beings in the universal systems of Thoth. This is how he has always played the game. Understand what I, METATRON, am saying here. I keep repeating it here until you understand it. Your thoughts affect other people. You consider yourself intelligent, but truly you are a fraction of what you were. Some of you carry higher intelligence than others, because some of you were one of the thought leaders for the people. These people were specifically trained in Atlantis to carry the thought consciousness ray. These people will be more knowledgeable with greater power influence than many others on your planet. They carry memories from the old times, to allow you to understand and remember the old ways as Thoth desired to preserve them. How else would you remember? The Great Light also had created a Gateway to help you remember. The Divine Realms sent to your planet their Divine Love Element to help you remember the higher rays of love, and the Lemurian Love Ways. Should she rise, she would be able to help others to remember, and thus bring change to the thought consciousness system Thoth had created. This would create a large imbalance in the thought consciousness grids of Master Thoth. This would create awakening processes that Master Thoth and that one, who received the voice of CAEAYARON in the times of Lemuria, who brought millions of Lemurians into the lower thought grids of Thoth, did not desire to happen. That one, who received the voice of CAEAYARON, who brought millions of Lemurians and Atlanteans into the lower human consciousness grids, is working hard with all his power to keep the people gridded into the grids of denseness in your day now, in the hope the millions of Lemurians will not see the GATEWAY OF THE GREAT CAEAYARON. You know him to be the channel of KRYON. Know KRYON does not exist. I, METATRON, do not know of a MASTER KRYON in the higher love spaces. There is none in existence. That one, the channel you know upon your planet, as the channel of KRYON, always has worked against the GREAT CAEAYARON. He does not desire to have the love within his heart. Know that the GREAT CAEAYARON called that one back to your planet, and I, METATRON, worked along with the GREAT CAEAYARON, as that one, the channel of KRYON, that is the one who programmed you deep into the lower thought grids, closed off paths within your thought consciousness, and within your DNA system, to stop you from rising. This is why, that one, who is the self-made gateway to the darker creation energies, could contain your memories and thoughts. It brought greater power into him. He received greater power from watching your memories suffer greatly. It was for him entertainment, like you watch your movies and you enjoy entertainment. I, METATRON, worked with the GREAT CAEAYARON to call that one, the one you know to be the channel of KRYON, that one who brought millions of Lemurians into the lower thought consciousness grids, to feed the darker universes with, the same one who brought trillions of light beings into the pain grids in the greater falls of the higher love universes, to open up the DNA grids of the people in your days, to allow you to make that desired choice. Would you desire to rise up out of your limited thought consciousness now? If so, you need to receive your Codes of Life back from the GREAT CAEAYARON, as there is no other way to evolve. I, METATRON, cannot give you back those Codes of Life, as I, METATRON have not created them. However, I, METATRON, can bring the power back into you to help you rise back into star love beings, if you receive the Divine Codes of CAEAYARON back, as I, METATRON, gridded your power in to let the great darkness feed from your light. They certainly do not desire the people to awaken to the higher love consciousness, as then the dark leaders can never programme the humans to their ways again. This would create large disruption to their dark plans to keep you eternally into their prism prison, taking place upon your plane, even though you do not understand it. Now the people are awakening to other thoughts. They are now sending out their thoughts to other humans, asking them to awaken to the world around you. Together you have a voice to change your world, and now you have the opportunity to bring your world into higher thoughts of love with the power of the GREAT CAEAYARON who is here with the DIVINE LOVE ELEMENT RAY to allow your DNA to rise. Your thought consciousness, upon rising, affects your DNA. Your DNA connects to each other also on the three different paths. Once you understand this, your DNA evolves, as then you understand how you cannot have the great victim consciousness within you any longer, should you desire to move forward from your seeming pain within. Know all you see around you is an illusion. A powerful illusion it is, but an illusion nevertheless. You think the body exists, but it does not. You think sickness exists, but there is no sickness. You think aging exists, but aging does not exist. This is the power of the collective mind together, working together with the mind, body and spirit. If you can understand the power of this, you can move to the next lesson of understanding how to bring more healing within your DNA, which your race needs very much. Your DNA desires to heal and is also part of the magnetic fields around your earth. Your earth runs on the same grids your DNA does. Your DNA is programmed to run on collective consciousness of the consciousness of the people. Within your earth fields are magnetic fields, and each thought you have, affects the other, and thus you create power pools of thoughts. These thoughts create your reality. When you become angry and fearful on one part, it affects another part of the world. That part of the thought pool in the pain, affects the weather, earth shifting, animals dying, disease breaking out and collects stronger and larger fear pools as then more pain is created. This feeds back into the earth, and the earth will demonstrate your own thoughts back to you. You think the ice is melting, but the ice cannot melt in ‘reality,’ because ‘reality’ does not exist. However, the thought consciousness exists. I, METATRON understand the power of your thoughts, since all works together. You are far from understanding it, as you focus too much on the ‘reality’ of the outside, rather than understanding what happens within the human thought system and how you work as one together collectively. Only upon the change occurring in your system, in your inner individual system, can you bring healing to your world, and to your people as you all connect to each other. I, METATRON, state, the only way that people can even begin to change, is if you return to the highest waves of love consciousness now, and that is with the GREAT CAEAYARON, who has always been my Great Counterpart. He has always been the Love Wave Aligner. But if you keep resisting, that is what your world will continue to demonstrate to each other. You chose for the freedom, and thus freedom from the love you received. No longer was it necessary for you to learn the ways of love and caring, and thus your consciousness became far removed from the love, further away from the love collectively than you understand it to be at this time. You all affect each other and infect each other. 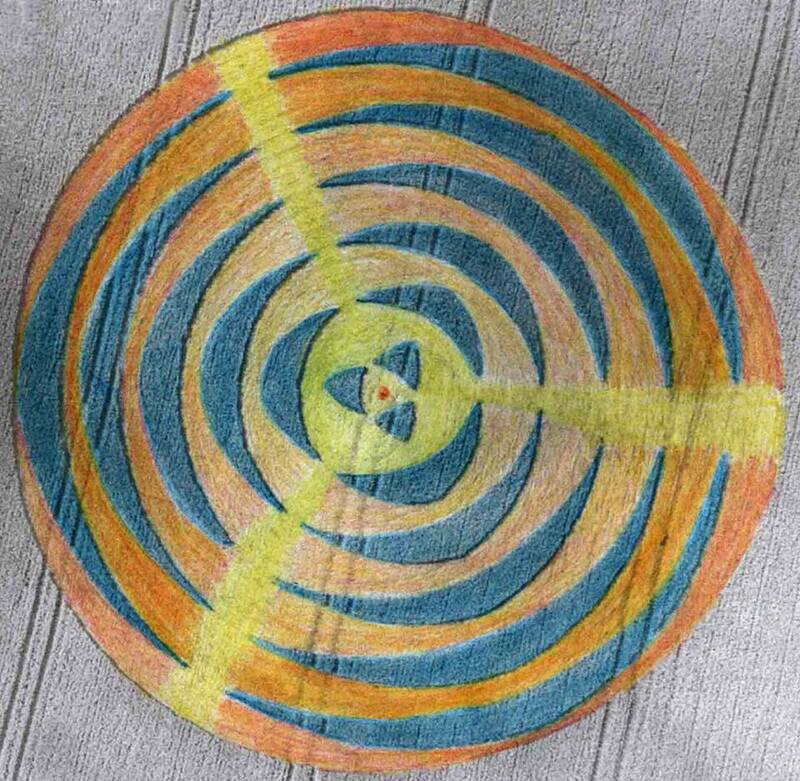 I will now explain the Thought Consciousness Grid shown here in the crop circle. ⭐Orange dot in the centre point: We begin in the centre. You, as an individual, are the dot in the centre experiencing consciousness as individual consciousness, but know you are part of the human consciousness fields. ⭐Yellow field surrounding the orange centre point: Around you, playing as an individual part of the collective, is the human consciousness plane. All human consciousness affects you as an individual. This where all memories of who you once were connect together. ⭐The three light beams coming from the centre, reaching to the edge of the crop circle: You work together collectively within three main pathways: Mind, Body and Spirit. Your memories connect to each other in three ways to control the human programmes. This was programmed by the great resistance who always desired the power, the knowledge and the intelligence of the greater love universes to overthrow all the Sovereign Love Power, to become the Great Masters of the Universe, and have all bowing to their supreme sovereignty. By owning you, they had much intelligence and power from you. These three light rays connect to the human consciousness. By entering thought commands into the light beams, which connect to the thoughts of the people, the dark beings were able to access each grid of thought to programme the human to do certain things and carry out certain commands. I, METATRON, would have stayed in service to the great resistance, and my power as Magnetic Force, would have grown much greater than it was. I, METATRON, would not have been able to escape. There would have been no hope for you then. Always, you would be slaves to them, and you would always be a feeding system for their darker universes. You would have been imprisoned to the leaders of the darkness forever. Be very, very grateful the Love has won. ⭐The blue mirrors: The blue mirrors are the mirrors of the Mind, Body and Spirit connecting into the eternal memories and thought systems which creates more power, knowledge and intelligence for the great resistance universes. Each generates greater power for each other, and within each other, magnifying greater power to the denser universes, to create more power structure to build upon and within. As you can see, the mirrors within each of the six layers grow greater in strength and in size, as each grows the other. These three mirrors within each grid form magnifies thoughts waves outwards to generate greater thought consciousness with. On the three levels of the mind, the body and the spirit, these waves programme the human consciousness thoughts to think certain thoughts. Thus, the memories remember these waves and work upon it, constantly feeding each other and magnifying each other, reflecting them back to each other to strengthen the same thought systems, unable to get out of the maze of entanglement. There was no way out of this maze until your thoughts can escape the dark prism prison, by you receiving the Divine Codes back that only CAEAYARON can give to you. The boomerang shapes enhance its energy. In reality, the mirrors pulsate and breathe. They are not stagnant. They draw in to the centre and grow outwards like a pump, creating a magnetic power-flow. ⭐Six layers of ‘light’ pools: Each pool of tainted light (know it was never pure light as the human cannot produce pure light, as it was tainted by the human consciousness programmed by the great denser thoughts) is collected into pools from more denser to more ‘enlightened,’ to connect to the six darker dimensions and the six lighter dimensions of Thoth, to help Thoth to ascend upwards. Thoth was always after the great power of the great universe. This has been the way until now. Each light pool is protected by mirrors. These mirrors grid the thought consciousness in so that it cannot escape outside of the human grids. These mirrors magnify the thoughts into greater power. This brought more power energy fields to the denser universes, but it also increases your thought consciousness power on your planet in waves of pain consciousness. Fear greatly was placed within your DNA to create pain upon your planet. These thought pools magnify rays and they breathe. Know these are vortexes of different rays. They move around and are not stagnant. They are living vortexes, working from higher to lower density for the 12 dimensions. Constantly energy within the vortexes is filtered, as the vortexes have a consciousness of their own. They ‘place,’ the denser energy into one pile of frequencies, and the more ‘enlightened,’ energy into another pile of frequencies, waiting to be collected by the light beams which connect them into the thought programme system. The lower density force works with the darker, denser six dimensions, all of which affect the human consciousness, and the higher rays of ‘enlightenment,’ from those pools, affect the six ‘enlightened denser dimensions, all affecting the human consciousness. They range in frequencies. The stronger the light pools become, the more energy can be taken away via the three light beams. Each layer is a consciousness. The more the fear expands, the more that fear consciousness could be used to programme the human thoughts with, to keep the human thoughts imprisoned. Better it is you learn to forgive more and understand that the only way to free yourself is with the forgiveness Love Codes that only CAEAYARON can give you. Better it is to become activated with CAEAYARON, I say as METATRON. One day you will understand that and awaken to that. The sooner you receive your Codes of Life back, the more you can do for your people upon your plane, and the more you can do for yourself.